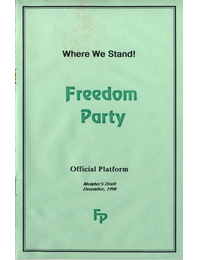 Statement of Principle; Where We Stand! 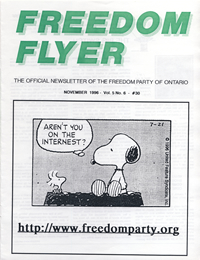 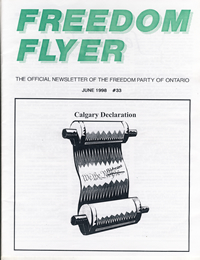 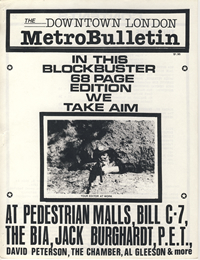 : Official Platform – Freedom Party of Ontario – Members Draft – December, 1998; Policy and Platform: Freedom; Aboriginal Issues; Abortion; Academic Freedom; Affirmative Action; Auto Insurance; Balanced Budgets; Business; Calgary Framework; Canadian Radio and Telecommunications Commission (CRTC); Censorship; Charter of Rights and Freedoms; Children & Child Care; Constitution; Crown Corporations; Culture; Democracy; Discrimination; Drug Laws; Education; Electoral Reform; Environment; Freedom of Choice; Freedom of Speech; Freedom Party; Free Enterprise; Free Markets; Free Trade; Fundamental Freedoms; Government; Gun Control; Health Care; Health Tax; Housing; Human Rights Commission (Ontario); Individual Rights; Insurance; Interest Rates; Jobs; Justice; Law; Lobby Groups; Majority Rule; Marijuana; Market Value Assessment; Medicare; MPP Salaries & Pensions; Multiculturalism; Official Bilingualism; OHIP; Ontario Hydro; Politics; Political Correctness; Pollution; Poverty; Principles; Property Rights; Property Taxes; Protectionism; Public Transit; Quebec; Racism; Referendums; Rent Controls; Self Defence; Socialism; Sunday Shopping; Taxation; Unemployment; Unions; Universality; Wealth; Welfare; Workers’ Compensation; Workfare. 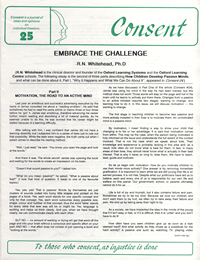 “Embrace the Challenge” being “How Children Develop Passive Minds (Part 2 of 3): Motivation, the road to an active mind” by R.N. 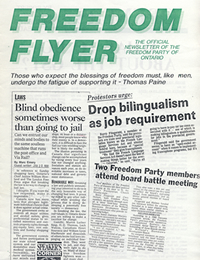 Whitehead, Ph.D.